A Companion to Cultural Resource Management is an essential guide to those wishing to gain a deeper understanding of CRM and heritage management. Expert contributors share their knowledge and illustrate CRM's practice and scope, as well as the core issues and realities in preserving cultural heritages worldwide. Edited by one of the world's leading experts in the field of cultural resource management, with contributions by a wide range of experts, including archaeologists, architectural historians, museum curators, historians, and representatives of affected groups. 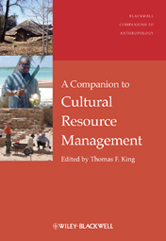 Offers a broad view of cultural resource management that includes archaeological sites, cultural landscapes, historic structures, shipwrecks, scientific and technological sites and objects, as well as intangible resources such as language, religion, and cultural values. Highlights the realities that face CRM practitioners "on the ground".